Ready-made and do-it-yourself organization solutions help you ensure that even in a well-stocked pantry, you can always find what you're looking for. A well-stocked pantry is key to planning and preparing meals efficiently. But even if you keep loads of ingredients on hand, they won’t do you any good if you can’t find them. 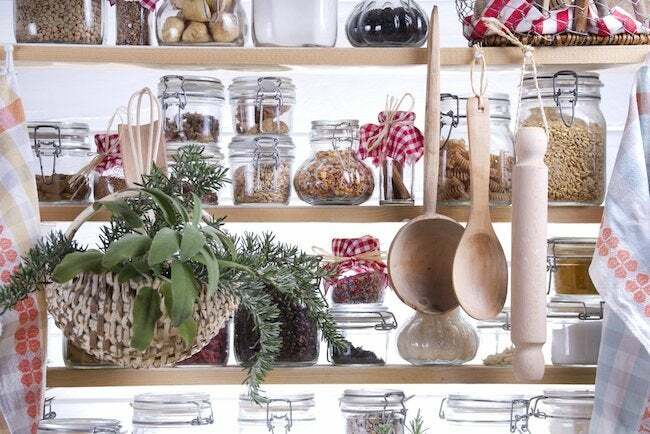 Here are a few tips on keeping your pantry items organized, visible, and easily accessible. The first step is to get rid of stale or expired items—and anything else that you don’t think anyone in your household will ever eat. Next, if possible, completely clear out your pantry shelves, clean them off, and start organizing. Make collections of like items—for example, soups and other canned goods, or pastas, legumes, and grains. As you restock your pantry, you’ll want to keep these groups together, making sure you can see every item. Fortunately, there are plenty of products (and DIY solutions) oout there to help you organize a pantry. Among the handiest are undershelf baskets, which add storage space and keep frequently used items accessible. Lazy Susans can help with accessibility but in small pantries, they can be inefficient space hogs. Stair step-style shelf organizers help keep soups and other canned goods readily visible; you can DIY your own by using lengths of wood. Finally, consider storing grains, cereals, and other bulk items in clear plastic stackable containers. They use space efficiently and let you see what you’ve got.